Sea, sun, sand, surf, sophisticated architecture and five-star service are the perfect ingredients for your next vacation. Nestled on a secluded Pacific beach just north of Cabo San Lucas, is the luxury Cabo all-inclusive resort, Pueblo Bonito Pacifica Golf & Spa Resort. This adults only, all-inclusive retreat is a haven where rest, relax and recharge are the order of the day. Pacifica’s talented chefs will feed you healthy, delicious and innovative food, prepared in any of several gourmet restaurants or in-suite service on your private terrace. Guests can take advantage of golf and water sports; or simply explore the white sand beaches, laze by one of the spectacular pools, and catch up on that great book. Everybody deserves to be pampered, especially on vacation! Let the award-winning Armonia Spa at Sunset Beach treat you with holistic products and techniques, making you look and feel amazing! 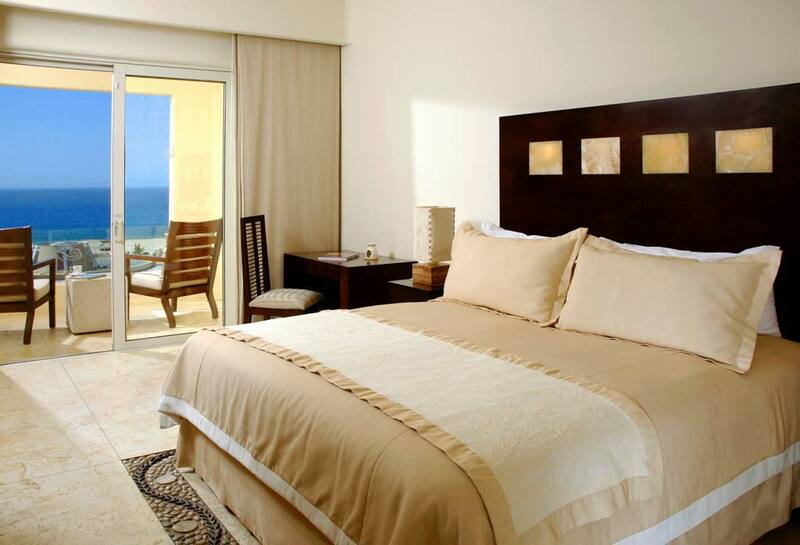 Pueblo Bonito Pacifica is an ADULTS ONLY all inclusive resort. What does this mean for you?….. For parents this means 24/7 kid free, worry free, decision free. For couples, the ultimate romantic experience with as much privacy as you desire. For the ultimate care-free vacation, and comprehensive all-inclusive meal plans, Pacifica Resort fills the bill. You not only have all-inclusive access to this amazing resort, but to three more! You have full all-inclusive privileges to indulge on all the Pueblo Bonito properties, which include… Pueblo Bonito Sunset, Pueblo Bonito Los Cabos and Pueblo Bonito Rosa as well as Pueblo Bonito Pacifica. With so many options, your all-inclusive access provides endless variety. Worry free, no decisions necessary, the best vacation you can ask for! You have access to a gorgeous beach with amazing sunsets, but you must know it is not a swimmable beach. This is for your own safety as the currents and undertow may be strong. This factor should not detract from your enjoyment, as there are an assortment of fabulous infinity-edge pools overlooking the Pacific, and plenty of other water activities. Siempre Restaurant (reservations required & dress code), Aqua Bar Aire, Bocados Deli, Pescados (reservations required & dress code), Refresca Bar, Partidos Bar, Fire & Ice Pit Ocean Front Martini Bar and all themed nights (please see your in-house concierge for calendar of available nights). Restaurants at Pueblo Bonito Sunset Beach: La Nao, The Bistro, Manila Bar, All Aquabars & Grills, Sunsets & Sushi, Zao Shen Asian Kitchen (reservation required), La Frida (reservation required, dress code, additional charges apply), Lobby Bar. 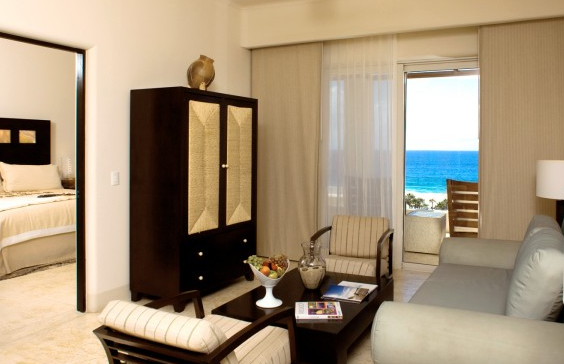 Enjoy Baja’s incredible indoor/outdoor lifestyle in your Garden level Deluxe Room with garden or partial ocean views. Sliding glass doors open directly onto your private patio equipped with comfortable teak furnishings, and easy access to extensive cactus gardens, pool area and beach. A king or two queen beds accommodate up to three people in these luxurious and tranquil rooms featuring all the five-star amenities. Mexican sunlight glowing through onyx door inserts, and the magnificent Pacific vista enchant you as you enter your Deluxe Oceanview Room with private balcony. The calming natural color palette includes beautiful stone inlaid floors and Zen inspired amenities. Comfortable furnishings and spa quality bathroom, with a king or two queen beds provide all the comforts of home for up to three people in your Baja hideaway. Mexican sunlight glowing through onyx door inserts, and the magnificent Pacific vista enchant you as you enter your Deluxe Oceanfront Room. Unobstructed views from your private balcony make you feel like you’re miles from nowhere. The calming natural color palette includes beautiful stone inlaid floors and Zen inspired amenities. State of the art entertainment technology is disguised in armoires by Mexican artesanos. Comfortable furnishings and spa quality bathroom, with a king or two queen beds provide all the comforts of home for up to three people in your secluded Baja hideaway. Mexican sunlight glowing through onyx door inserts, and the magnificent Pacific vista enchant you as you enter your luxurious Oceanview Suite with private furnished balcony. A spacious living room, including a queen sofabed, armchairs and desk adjoins a separate bedroom, with a king or two queen beds, accommodating up to three people. The calming natural color palette features beautiful stone inlaid floors and Zen inspired amenities. Art by local artesanos, and spa quality bathroom round out the comforts of home in your Baja hideaway. 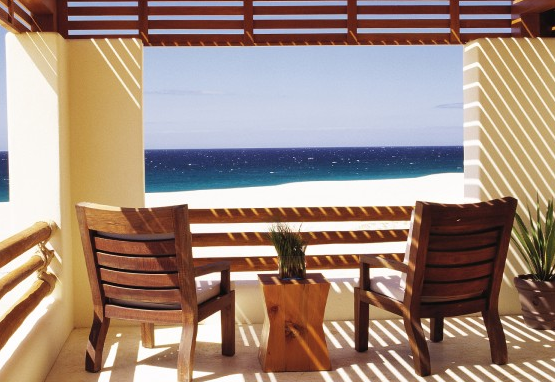 Oceanfront Suites at Pueblo Bonito Pacifica Golf & Spa Resort are “best in house”, offering the ultimate secluded hideaway with maximum privacy, for your Baja escape. Mexican sunlight streaming through onyx door inserts, and the magnificent Pacific vista enchant you, as you enter your suite, which includes a separate bedroom with king bed. Unobstructed views from your private balcony make you feel like you’re miles from nowhere. The calming natural color palette includes beautiful stone inlaid floors and Zen inspired amenities, including a pillow menu. State of the art entertainment technology is disguised in armoires by Mexican artesanos. 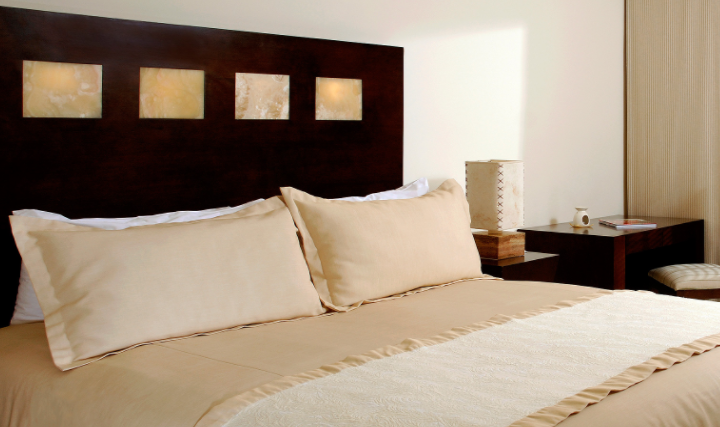 Comfortable furnishings and spa quality bathroom, provide all the comforts of home for up to three people. Just north of the town of Cabo San Lucas, behind the mountain on the Pacific side. This resort is perfect for Adults who want to escape from everyday life and experience a true retreat style vacation. Strategically located for privacy and solitude, but within easy driving distance of the town of Cabo San Lucas, and close to the road heading north to Pescador, Cerritos Beach and Todos Santos. 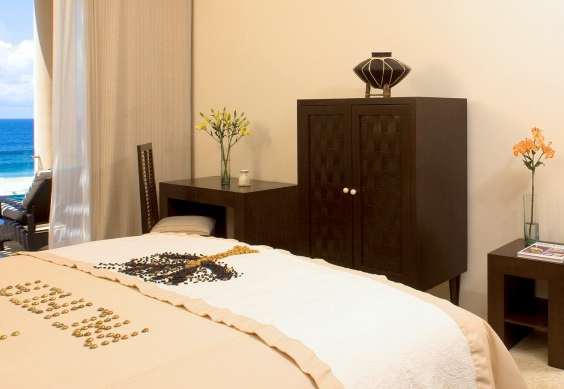 The full service Armonia Spa is known especially for its Temazcal healing herb treatment. This indigenous ritual takes place in a domed bath enclosure. In addition, hot-springs, men’s, women’s and couple’s saunas, and a variety of mud baths and massages, as well as massages on the beach are available, to renew and recharge your body and soul on your vacation retreat. All adult guests over the age of 18 are welcome at Pacifica. Minimum check in age is 21 years. Only registered guests are allowed in the guest rooms. Pets are not allowed. Airport shuttles (surcharge) can be arranged prior to arrival and departure dates. Free Wifi is available in all guest rooms and some public areas. Free self and valet parking. Room amenities include phone, air conditioning, TV with premium channels, premium bedding, and furnished balcony or patio. ATM Banking, Tennis Court and Business Center are all available to guests. Lessons, classes and games are available at the onsite Fitness Center, along with dancing and beach yoga. Other land activities including tennis lessons, golf, mountain biking and beach volleyball can be arranged for an additional fee. Water activities including surfing, scuba, snorkelling, water-skiing & windsurfing, may also be arranged at extra cost. Pueblo Bonita Pacifica is a golfer’s haven with a dedicated course available to all guests, overlooking the Pacific Ocean. You won’t want to overshoot the green on this course, or you’ll be finding a new ball! In addition, Los Cabos is proud to offer some of the most scenic and challenging golf courses in the world, designed by famed professional golf architects. Your concierge can make all arrangements for you to hit the links at any of the course(s) of your choice. The magnificent architectural arch framing the turquoise waters of the Sea of Cortez seduces you from the moment you arrive. Have the best of both worlds at this Cabo all-inclusive resort… Discover all adult, all-inclusive Secrets Puerto Los Cabos Golf & Spa Resort.